A postcard is a quick and easy way to share important information. Strike up a conversation. Introduce your company or organization to your potential clients in a brief and creative way. Create eye-catching promotional pieces. Postcards inform your clients about products and services. Full-color and high-quality prints help make your post cards stand out among the rest. The key to an effective postcard is a solid message. The key to a solid message is a strong brand. Your company has a big identity and it's important to let it shine in all of your marketing collateral and printed materials. Customer and client follow through happens more readily with a cohesive branding message. Promotional marketing materials like customized postcards present endless possibilities for your company. At H&H, we offer a large selection of printed marketing collateral ranging from business form booklets and forms, banners, calendars, decals, vehicle wraps, retractable banner stands, trade show displays and other customized printing products. 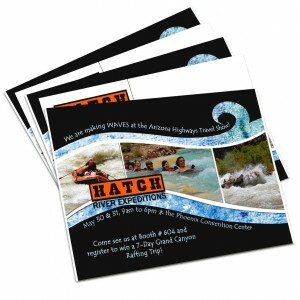 Postcards are one of the most affordable and highly effective direct-mail marketing strategies.